This morning we had official confirmation from the Bank that Jim Kim will not face any competitors in his bid for his tenure at the Bank to be renewed. With absolutely no intention to reduce this coronation to a farce-like procession, the Bank has indicated they will strictly adhere to the appropriate procedures. In response to the DC Communiqués calling for “open, merit-based and transparent selection of the World Bank President,” the Executive Directors have approved a process for selecting the World Bank President as an important part of the governance and accountability reforms. Kim will shortly be interviewed by the board and should that process determine that he is the best candidate in a field of one expect an October announcement confirming Kim’s re-appointment at the forthcoming annual meetings. Tick-tock, tick-tock – that is the sound of time slipping away from the World Bank’s efforts to hold on to whatever remains of its legitimacy as a global development leader that lives by and values its own rhetoric about democratic governance, meritocracy and transparency. As the minutes of 14 September 2016 slip inexorably away, so does the likelihood that any of the Bank’s shareholders will dare put forth a candidate to compete with the US’ anointed heir to the throne, as today is the deadline for nominations. 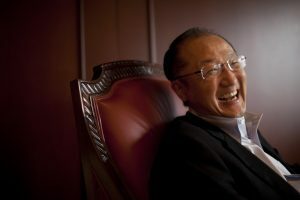 We shall know our prophets by their fruits, and the same is true for World Bank presidents. The first term of President Jim Kim is coming to an end, the Bank’s Executive Directors will decide about his re-election in the coming weeks. In the energy sector, the president’s harvest has been meager indeed. Jim Kim’s first term coincided with the global breakthrough of wind and solar power. From 2011 to 2015, these technologies accounted for two thirds of all the renewable energy capacity added throughout the world. In 2015, the added wind and solar power capacity for the first time outpaced all other sources of electricity – including fossil fuels and hydropower – combined. Wind and solar power have not only become cheap and ubiquitous. They can also be deployed quickly, have a low social and environmental footprint, and are effective at reducing energy poverty in rural Africa and South Asia. In other words, wind and solar power are ideal investment opportunities for a development bank.